DarqUI Live is now DarqUI Unified which combines the features of standard and Live interfaces into one. Everything you enjoy about DarqUI Live is still available and updated for the Terrors of Thalumbra expansion. In addition to larger size window options and a new help system, DarqUI Live users can opt to take advantage of an all-new configuration app with features like Quick Setup, backup and restore, character and spell file maintenance, and a new lookup feature that queries Daybreak servers for spell lines and icons to use for your spell buttons. Everything you need is on the new DarqUI Unified page. Thank you for using DarqUI Live. There is one issue I am having, since you sent out the changes to login screen... it does not seem to read the eq2_recent file anymore... or at least not like it used to do. I play different accounts, but it keeps going back to "account 1" when I get to login screen. Its kinda annoying, especially when loading up multiple characters. is there one? for profit and drums, there is no default start button, and even when I added the start button file individually from a separate download for drums, it didn't even work. how do i get teh mob casting bar tto show up just switched to this ui and I cant find it. Mob casting is in the same window as player casting. Drag the bottom edge of the window down to see it. If you click the blue gem in the upper left corner of the casting bar you can check a box for "show casting bar sample" in the window manager. 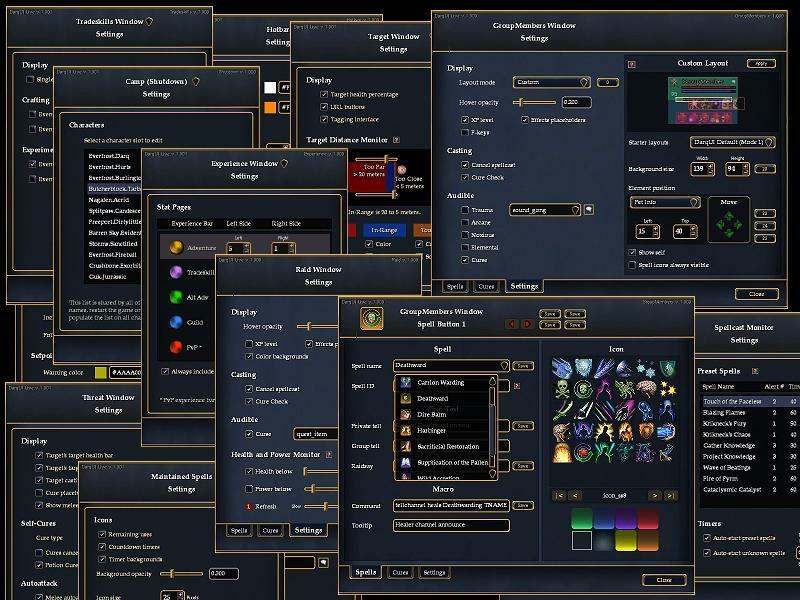 This will let you see and resize the window without having to cast spells. Thanks for your response! I guess perhaps I have the updater in the wrong folder. Right now it's in the DarqUI folder, but I believe I am using the Unified UI. HELP! <-- The DarqUI Unified utility should look like the blue and white icon under my name. When you run it, you should get the DarqUI Unified Setup window which guides you through the initial setup. The folder will be named \UI\DarqUI_v3. Instead of putting the utility into \UI\DarqUI, move it out to the main \UI\ folder and run it again from there. That way, you can delete or abandon the \UI\DarqUI folder which is no longer current. Hi. When I attempt to use the Updater, I receive a 404 error. It says "Could not receive list of updates. The remote server returned an error." Any suggestions? DarqUI Live is now DarqUI Unified which combines the features of standard and Live interfaces into one. Everything you need is on the new DarqUI Unified page. I have 3 instances of EQ2 on my PC. Drop a separate copy of the utility into the \UI\ folder for each of your installations. When you run one of them for the first time it will detect and save the location. The UI folder path will be the first setting on the Files tab of each copy of the utility. I was wondering if it was possible to completely disable the little reactive window which can be disabled/enabled via the button right of the sound? I ask because though I do click to disable it, if I close the TS window then go back to it later on I have to disable it again. It doesn't save. Is there something in the XML I can disable or delete to permanently disable that progressive reactive window? I'm not sure if this is controlled by EQ2, or if it can be controlled by DarqUI. In the tradeskill window, when it is first opened, it's been defaulting to the Default crafting station. 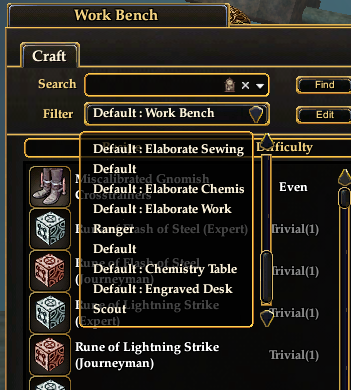 I've added a lot of filters over the years, and it seems the default crafting station is always at the bottom of the list - doing writs, I would like to default to Recently Crafted - which is at the top. Is there a way to set it to always default to Recently Crafted? Or, if it could default to whatever you last had it on would be helpful. But right now, I have to change it every time I do a writ. I would also like to be able to clear out some of those filters - is there a file that I can edit? Caela, sorry for the delay. Not sure how I missed this post before. 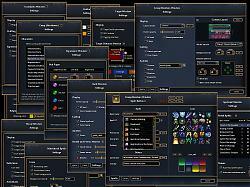 If you want to edit the file, it's eq2_recipe_filter.vdl in your base game folder. All characters share the same list. You can select a filter in the recipe window then click edit, then click delete and the filter disappears, but if you have dozens of filters I can see where this would get tedious. Use Notepad to edit with care -- I left out a bracket or two on purpose just to see what would happen and the list did not load at all. I tinkered a bit (see what I did there) with the filter dropdown to make it load something besides unfiltered by default, but it looks like you have to actually click with the mouse to get it to update. Even a "favorite filter" button wouldn't force an update. If you have not already, definitely check out Sigrdrifa's filter replacement if you are reworking your filters. It may have everything you need already in the presets. I was running the regular DARQUI and then switched to the DARQUI Live. In both cases my threat window is not showing up. I even swtiched back to the default UI. I do have the always show threat window checked and have tested it out with a training dummy in my guild hall. I hit F10 and the window is not there. How do I get the window to show up? I am also running in windowed mode. Edit: Nevermind I finally found it. Seems I didn't have a key assigned so took some advice and setup CtrlT and it now shows up. Last edited by FoxdenVixen : 09-19-2015 at 01:23 PM. Anyway we can resize the target and implied target window? I want to make the HP / Power bars a different size.